I’ve been reviewing restaurants for long enough now to see multiple restaurants rise and fall, often at the same address. The small space at the edge of City Point near Moorgate is a case in point. Six years ago it was a forgettable and now long-forgotten Korean restaurant. It was then taken over by Bad Egg, an egg-focussed venture from chef Neil Rankin and gastropub operators Noble Inns. Although Rankin has since moved on to bigger and better things, Noble Inns remain in place and have turned Bad Egg into a spin-off of Rankin’s Smokehouse – the aptly named Little Smoke. To the untrained eye, or the wearily cynical, Little Smoke appears to be a cash-in on the justifiable popularity of the nearby Pitt Cue with blackboards advertising various cuts of meat sold by weight. The difference, however, is evident once the meat passes between your lips – and Little Smoke does not come out well. The chopped brisket roll from Smokehouse is also available at Little Smoke. I’d forgotten that it’s not a meat-filled bread roll, but a croquette. 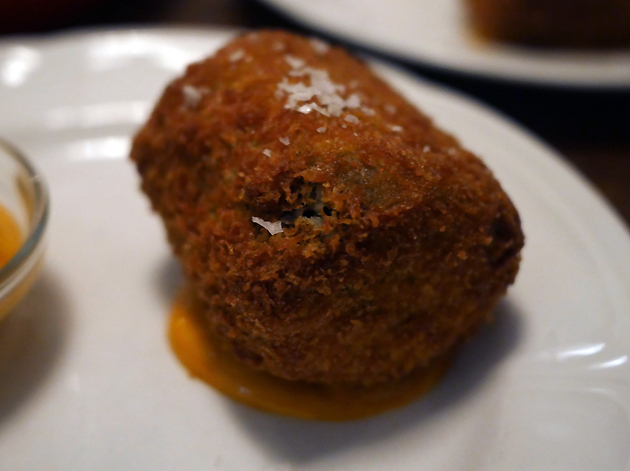 It’s a competently done croquette with a crispy crumb shell that’s not at all oily, but the reasonably moist and meaty strands of beef inside were merely satisfactory. Which is more than can be said for the tame Korean-inspired dipping mayo served on the side. If that feeble mayo was Korean, then that President has unimpeachable judgement. Y’know, Park Geun-hye. 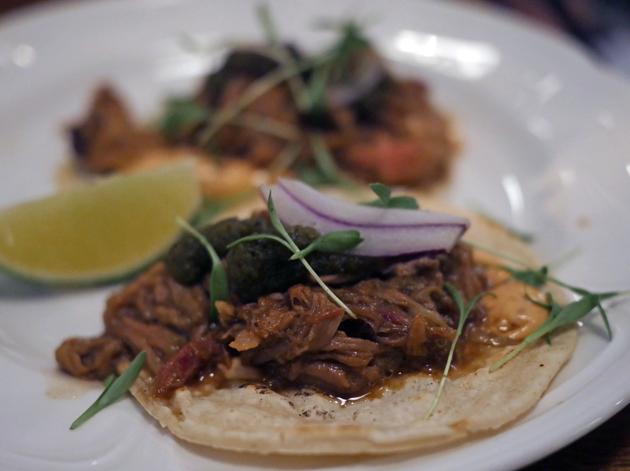 Similarly so-so strands of beef made an appearance in the beef tacos dressed with a chipotle aioli that may, at some point, have been in the same room as some chipotle and garlic. The tortillas weren’t inedibly bad, but this impersonation of proper maize tortillas was unimpressive in its grey and flaccid lack of taste and fluffiness. Happy Buddha, Templeton Peck, Vicious Alabaster and the Lensman joined me for this meal. Mushy, modestly creamy corn kernels, served off the cob, came with a generic cheese and other odds and sods mixed in. It was an inoffensive and undemanding goop which, if I’m lucky, will be fed to me intravenously in my decrepit old age when I’m soiling myself with such regularity that I’ll need such glorified baby food. The less said about the stodgy, hard and past-their-prime tortilla chips the better. Good tortilla chips are hard, but average and piss-poor tortilla chips are easy. 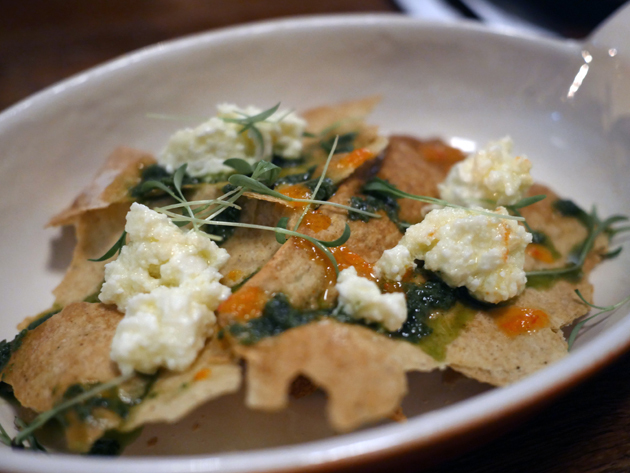 Aside from the brisket rolls, the least disastrous of our starters, and also the most surprising, had to be the reasonably crisp wafer bread pieces topped with a creamy, crumbly and lightly salted feta. 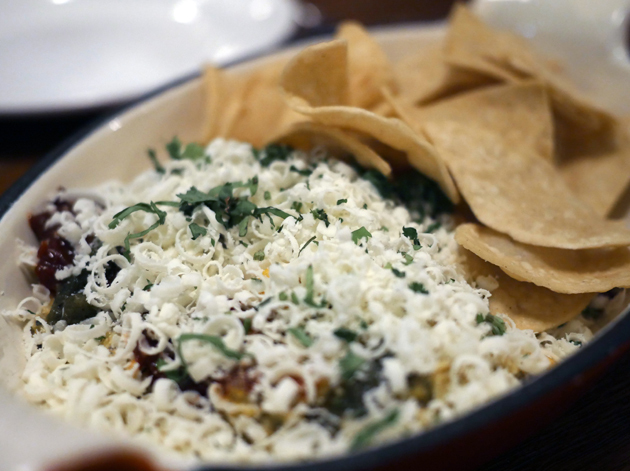 It didn’t bowl over my inner cheese snob, but it went down surprisingly well with the lightly sour and tart sauce. If you’re easily impressed, the type that’s bowled over by huge portions and automatically associate good looks with high culinary standards, then you’ll unabashedly love Little Smoke’s cuts of meat. The reality was far less impressive. 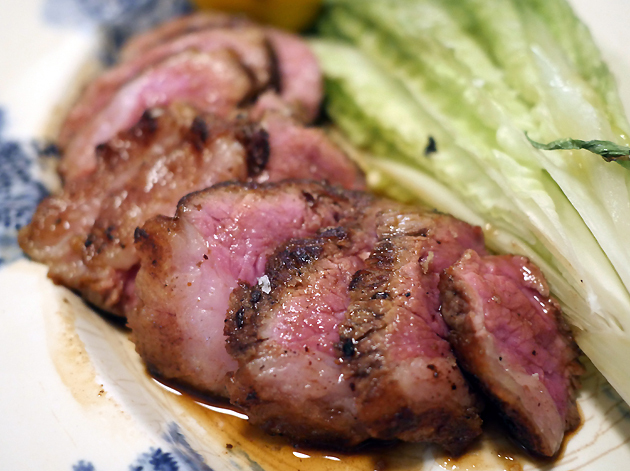 Lamb rump was a plain affair with no earthiness or funkiness, but the slices of baby sheep were at least moist. 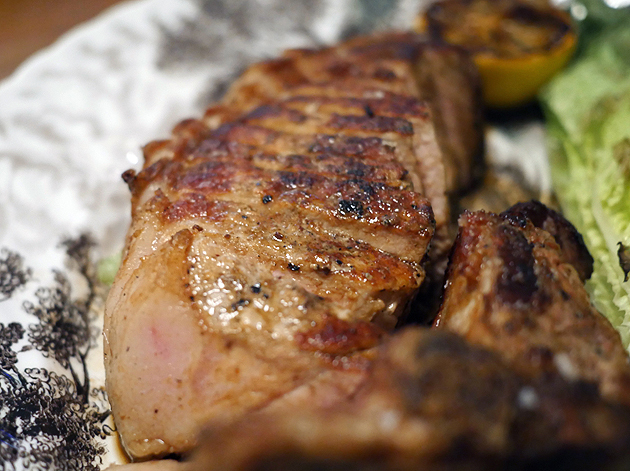 While not rock hard, the unyielding slab of pale pork t-bone was far from the tender joy it should’ve been. 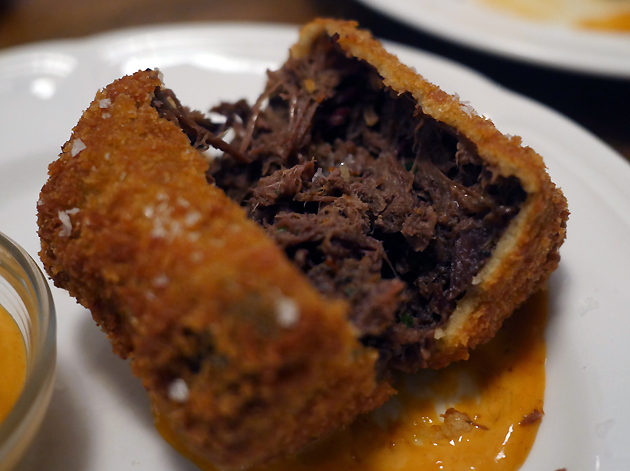 It was a dowdy, frumpy and third-rate option compared to the immensely characterful swine flesh available at Pitt Cue. The geological strata of dull, unrendered fat certainly didn’t help. 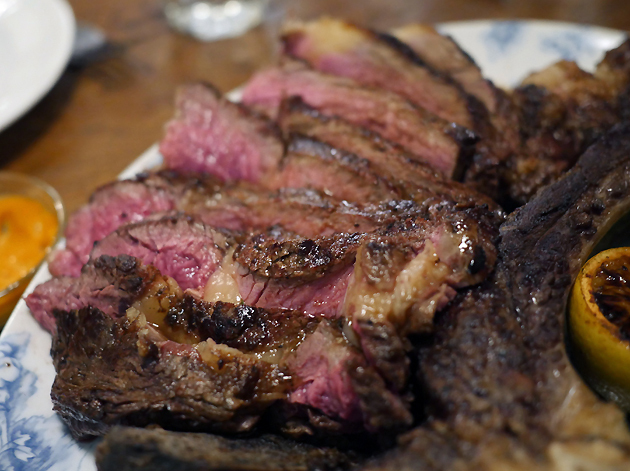 The best of our meats, by far, had to be the cote de boeuf. Cooked medium rare, the caramelised crust was sensibly seasoned, while the moist pink flesh underneath had a mildly beef tang. It couldn’t touch Temper’s varied beef cuts in terms of visceral character, but it was still perfectly enjoyable on its own terms. 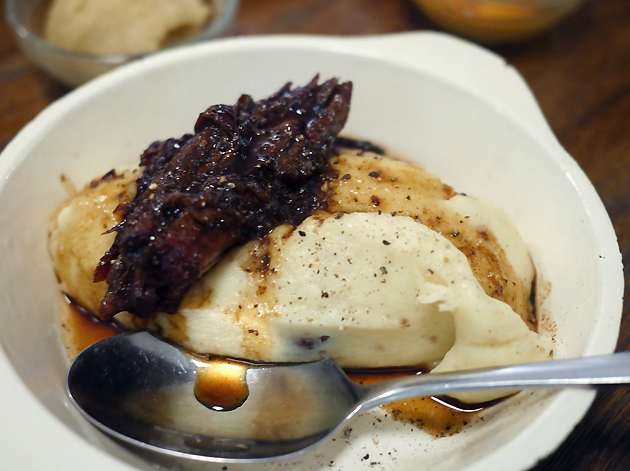 For some reason the kitchen insisted on topping creamy mash with excessively soft and generically seasoned burnt ends. There’s butchering beef and then there’s making a mockery of it. 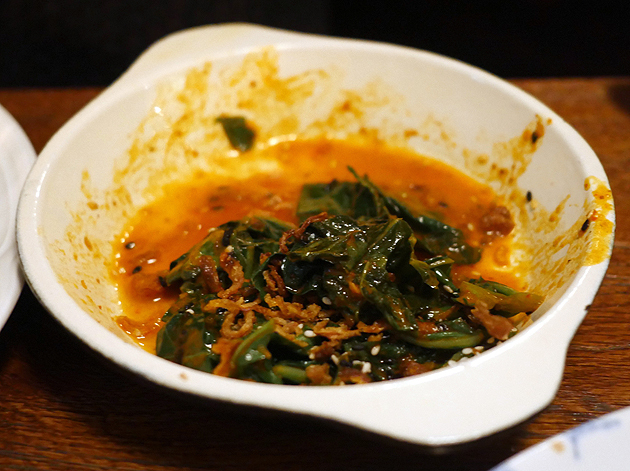 Burnt chilli greens were worse – uncomfortably bitter leaves dressed in a bright red sauce that somehow managed to be completely unspicy. Thin yet creamy and nutty polenta was the best of our sides. Although a tad too over-processed in its smoothness, it was pleasing enough. The mushrooms and truffle oil only managed to add a modest amount of earthiness and little in the way of aroma. But at this rate, we’d take what we could get. Sorry folks I forgot to take a photo of the polenta. Despite being a spin-off of Smokehouse, Little Smoke lacks the character that its parent had when it first opened. Instead, it oddly feels like a cheap and hasty attempt to capitalise on the popularity of other chophouses in general and the nearby Pitt Cue in particular. Although there is joy to be had from choosing carefully from the blackboards of meats sold by weight, it’s hard work. Combined with the lacklustre quality of many of the other dishes and it seems like more trouble than it’s worth. Not even the cosy surroundings are enough for me to even tentatively recommend this restaurant as a fall back option, not when there are so many other fine meat palaces in this city to choose from. If Little Smoke is a reflection of the current state of Smokehouse, then I can only send Rankin my commiserations. Total cost for one person including soft drinks (when shared between five) but excluding tip: £54 approx. Tags: beef, burnt ends, corn, croquettes, feta, lamb, little smoke, london, mashed potato, pig and butcher, polenta, pork, restaurant, review, smokehouse, steak, taco, temper. Bookmark the permalink.